Placing a loved one in an assisted living facility can be a difficult decision to make for most families, which is why abuse and neglect suffered at the hands of a trusted caretaker can be an even more terrifying and confusing experience. Both the elderly persons and their family suffer, but many times the physical trauma and emotional distress the nursing home resident faces can have dire consequences for their health and wellbeing. The Centers for Disease Control and Prevention published data from the 2014 National Study of Long-Term Care Providers and found that there were 15,600 nursing homes nationally with a total of 1.7 million beds with an average capacity of 106 certified beds. Additionally, an independent research study found that only 1 every 14 incidences of elder abuse was reported to authorities, which underscores the need for prompt response if you believe your loved one is suffering neglect or abuse in a nursing home. At Harbin & Burnett, our South Carolina nursing home abuse lawyers believe that the rights of your elderly loved ones should be protected in a court of law. We will always seek the MAXIMUM amount of compensation due to our clients, and our goal is to serve the victims of elder abuse by bringing the negligent parties to justice. To find out how we can help, simply fill out the Free Case Evaluation form located on the right side of the page, at the top. There is no obligation to proceed and the details of your case are always confidential the review is 100% FREE. 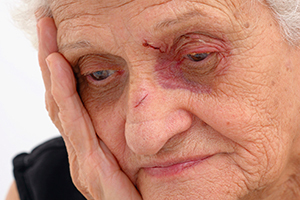 Where can elder abuse happen? The National Center on Elder Abuse (NCEA) reports that senior neglect is most often seen in institutions, private facilities, and community living situations or other types of long-term care living facilities, but it can occur anywhere and in a number of situations. What are the signs of abuse or neglect? What types of nursing home abuse exist? The National Center on Elder Abuse notes that elders who experience physical or mental nursing home abuse have a 300% higher mortality rate than their peers who have not been abused. Levels of psychological distress and feelings of worthlessness are coupled with a lack of motivation to live in the most extreme cases. Who regulates South Carolina nursing homes? State government regulates inspections and licenses for nursing homes, and the Centers for Medicare and Medicaid Services (CMS) oversee Medicare and Medicaid programs on the federal level. What rights do nursing home patients have? If I'm contacted by a risk manager to discuss my loved ones injury, should I speak with him or her? Never disclose information to a risk manager, as the entire function of a risk manager for a nursing home is to resolve issues and get them out of trouble. It is more prudent to decline to speak with him or her and contact an attorney with experience in nursing home abuse litigation, who will stand up for your rights. At Harbin & Burnett, we know a good attorney can help relieve the stress of your nursing home abuse case, and we are committed to helping you get every dollar you deserve in the minimum time possible while preserving the rights of your neglected loved one. To learn more about your legal rights with a no-cost, no-obligation initial case consultation, contact us at 1(888)821-0247. One of our intake staff members will connect you with one of our lawyers best suited in handling your claim after a few preliminary questions. You may also contact us online by filing out the FREE CASE REVIEW form located at the top right hand corner of this page.